Danny’s Bluebird Socks are on the cover of my eBook, Cat’s Sweet Tomato Heel Socks. The pattern includes everything from the baby-sized version that you see being carried away by a bluebird (on the cover) all the way up to a large adult size (8 sizes in all). 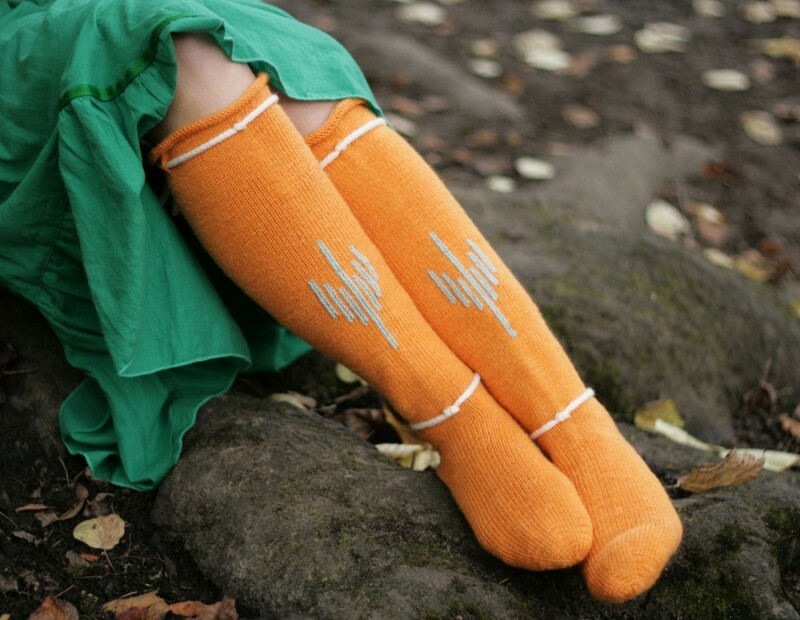 To help you come up with your own original designs, you’ll find tips at the end of the pattern for designing and fitting knee-high socks using the Sweet Tomato Heel method. You can either buy this pattern alone for $6 (to buy this pattern alone, click here), or buy the eBook for $20 (to buy the eBook, click here) which will ultimately include 10 patterns, including this one, along with many, many useful techniques and extras. The single pattern does include everything you will need to know how to knit the socks. There are abundant included video tutorials. The eBook can be viewed and stored on any device you own, including Nook, Kindle, iPad, phone, etc., and you can print any pages you need to carry with you.